In many cases, homeowners themselves can improve the efficiency of their air conditioners simply by taking a few judicious steps. You probably know that you can save a great deal of money simply by setting the thermostat to 78°F instead of 75°F. But you can do much more by making use of your thermostat’s programming features. For example, set the thermostat to turn off the air conditioning twenty minutes after the sun goes down and switch to fan-only mode. Then open up the windows to the cool air of the evening. Or, if you run your AC all day to an empty home, use it to turn the system on 20 minutes before you arrive home at night. 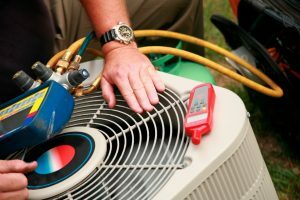 We recommend maintenance sessions once every year for your air conditioner, as a means of keeping it running and avoiding wear and tear. It’s kind of a tune up for your system, allowing the technician to correct little problems like loose bolts and clogged filters while looking for signs of bigger issues that may be brewing. If further repairs are needed, you can then schedule them at your leisure, instead of rushing around in the wake of an unexpected breakdown. In addition, addressing all of those little issues means that your system will function much more effectively, cutting down on high summer costs and reducing the wear and tear on the system considerably. We spoke above about thermostats, and if yours is more than ten years old, then you may benefit from upgrading it to a new one. Smart thermostats and similar high-end models can help you shave precious dollars off of your monthly bills. Other upgrades can do even more. For instance, a zone control system installed in your ducts divides your home into sections, allowing you to set different temperatures in different rooms or even shut off the air in rooms that aren’t being used while still running the air in parts of the home that are occupied. Similarly, whole-house dehumidifiers can deal with excess moisture in the air, which allows the air conditioner to do its job with much less fuss. If you’re looking for ways to improve your air conditioner’s performance this summer, call the friendly professionals at Westland Heating & Air Conditioning. We provide quality air conditioning service and installation throughout the Westlake, OH area!